MANHATTAN, Kan. — Grown like a snowflake and sharpened with a sewing machine, a novel device by Kansas State University researchers may benefit biomedical professionals and the patients they serve during electrode and organ transplant procedures. 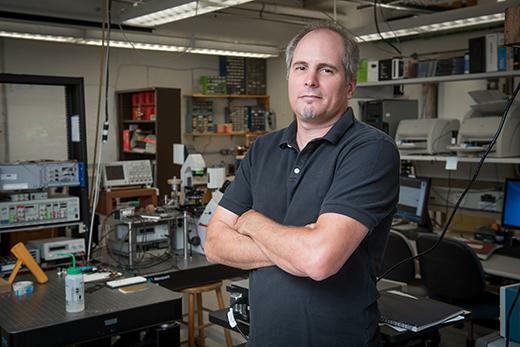 The device uses gold nanowires and was developed by Bret Flanders, associate professor of physics, and Govind Paneru, former graduate research assistant in physics, to manipulate and sense characteristics of individual cells in medical procedures. The gold nanowires are 1,000 times smaller than a human hair. "Conventional surgical tools, including electrodes that are implanted in people's tissue, are unfavorably large on the cellular level," Flanders said. "Working at the individual cellular level is of increasing importance in areas such as neurosurgery. Potentially, this sleek device, made from gold nanowires, could get in close and do the job." Flanders said the size of the nanowires is what makes their device so unique. Each wire is less than 100 nanometers in diameter. Cells in skin and hair are about 10-20 micrometers in diameter, while red blood cells measure about 7 micrometers. Because the wire is so small, it can pierce a biological cell to stimulate the cell membrane and investigate its interior. The nanowires are electrochemically grown, meaning they do not grow by a lengthening or enlarging an existing wire, but rather by accumulating particles from solution into a new wire. In heavily zoomed video footage the nanowire appears to grow out of the micrometer-thick electrode. Actually, the nanowire forms similarly to how a snowflake is assembled in the sky when water vapor molecules in the air condense onto the surface of pollen or dust and grow non-uniformly until they become a recognizable snowflake. "We start with a sharp microelectrode on a microscope stage," Flanders said. "Similar to snowflake formation, the gold atoms condense onto its sharp tip. Like the water condensing onto the snowflake seed, the golden solution condenses onto the gold 'seed,' or the microelectrode." The researchers developed sharp electrodes with an unconventional tool not found in many laboratories: a sewing machine. "It's like putting the wire in a pencil sharpener, where you turn the crank to sharpen it, except we don't do it mechanically with a pencil sharpener — we do it with a common salt solution and a sewing machine," Flanders said. "This turned out to be the approach that worked the best, and the sewing machine cost only $10 at the Salvation Army." The sewing machine oscillates the microelectrode up and down in a beaker of potassium chloride solution. Application of a voltage dissolves the tip of the microelectrode. "The process sharpens the electrode because the tip is in the solution longer than any other point," Flanders said. "If we did not oscillate the wire, the whole wire would dissolve. Instead, dipping the tip in and out causes the tip to dissolve the most, thereby sharpening it." The sharpened electrode allows the nanowire to grow. The researchers then dismount the nanowire from the electrode and ship it to collaborators across the country, including a nanofabrication company that may incorporate the invention into a pre-existing device to provide it with greater power. The research was recently published in the journals Applied Physics Letters and Nanotechnology, and has been presented at meetings of the Materials Research Society and the American Physical Society. The project is funded by the National Science Foundation and the National Institutes of Health's Brain Research through Advancing Innovative Technologies, or BRAIN, Initiative. The patent was issued to the Kansas State University Research Foundation, a nonprofit corporation responsible for managing technology transfer activities at the university. The physics department is in the College of Arts & Sciences.